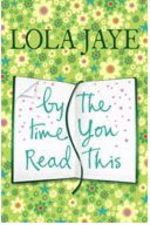 ‘By the Time You Read This’ is the sweet-as-honey debut novel by Lola Jaye. I took this along with me on my travels to Jamaica, and devoured it in a couple of days. The plot centres on the life of Lois Bates, a bright and feisty young woman who lives in south London with her mother and step-father. We join Lois at age 12, on the cusp of the awkward teen years, where not only does she find it difficult to relate to her mother and new step- dad, but she also has to find ever inventive ways to avoid the school bully. However, life is set to change for the young heroine when her aunt presents her with a life manual, featuring the tender words of her dead father who passed away when she was a little girl. From this moment onwards the manual provides Lois with the confidence to deal with whatever life throws at her. For me, a good book has to tap into a range of emotions and ‘By the Time You Read This’ achieves this effortlessly. I was laughing out loud in places, and at the opposite end of the spectrum, choking back the tears. Ms Lola Jaye has to be commended for dreaming up such believable characters that really come to life. Lois’s journey through everyday situations such as unrequited love, office politics, friendships, grief, are written with such sincerity that at times it reads more like a memoir than a work of fiction (who knows, maybe it is). 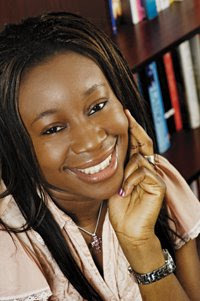 As a first time writer, Lola Jaye's journey to be published is a book within itself. Formerly a Counsellor for the NHS, Lola often dreamt of becoming a novelist and finally decided to put plans into action in 2002. Her painstaking journey towards being published can be found on her blog 'Diary of an Unpublished Author'. But all her hard efforts paid off eventually, and the talented writer now has a book deal with publishing giants Harper Collins, no less. For all budding authors out there, Lola’s story of tenacity, determination and hard work is truly inspiring. I’ll hopefully be catching up her in the next couple of weeks to find out how things are going. But in the meantime, do pick up a copy of this fantastic book. Pride is hotter than July!